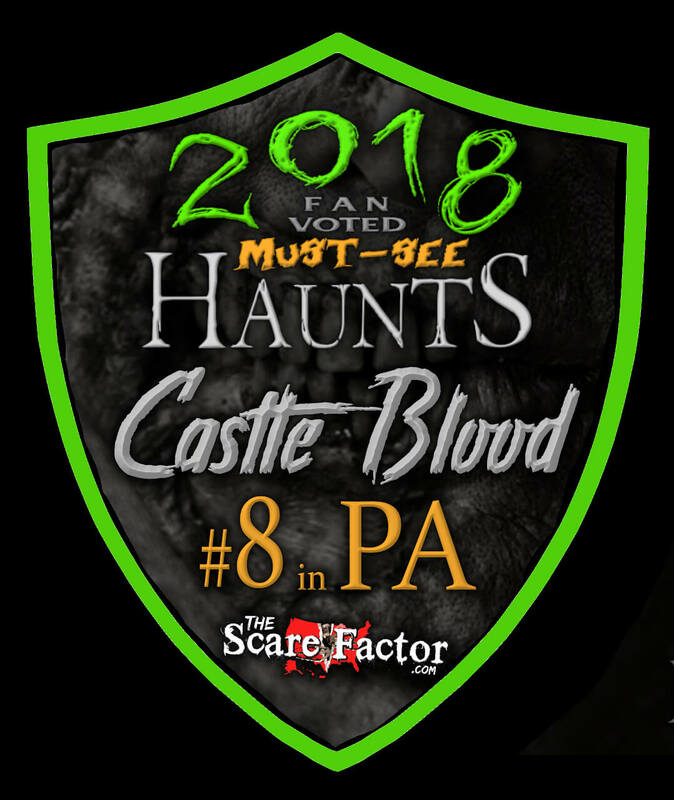 Castle Blood is a Haunted Attraction located in Monessen, PA. Team Scary Potter and the Hauntwarts Express reviewed this attraction on October 1, 2016. With over 20 years of haunt-xperience under their belts, the Maccabre Family have developed the act of entertaining the living into a fine art. Take Castle Blood, the family estate that they’ve built up inside a 100-year-old funeral parlor… part spookhouse, part interactive, narrative game. It continues to attract droves of the mortality-challenged every Halloween season and it’s back again… better than ever! So come down to Monessen, Pennsylvania to see if you are brave enough to challenge the castle’s undead denizens, solve their puzzles, and escape with your soul. There are opposing coin faces to examine here, as Castle Blood features two very distinct types of actors. On one hand, the Scarers, the Castle’s version of traditional haunted miscreants – for an attraction that pretty openly decries the boo-scaring associated with other haunted jaunts, they’re surprisingly good at it. These hit-and-run haunters appear seemingly out of nowhere, offer their dismay, and then shrink back into the woodwork. There seemed to be a few dozen of them and their interloping was usually effective. The primary residents of Castle Blood, though, are it’s interactive hosts. Each of these nocturnal tour guides helps you along your quest (albeit begrudgingly at times), usually providing information before requesting a token or challenging you to a test of some sort. The bulk of Castle Blood is a form of interactive theater, so the quality of their main actors is the single most important component toward providing a successful experience. Fortunately, the cast of Castle Blood were competent and convincing. Varied and colorful, each face brought an entirely new experience. Some inhabitants were friendly, jovial; others exceedingly menacing and brooding. One particularly-scornful fellow was belittling and demeaning in all the best ways (as ironic as that may sound). Our favorite castle denizen appeared early in our trek – an off-color chap named Digger. His parting words, clearly improvised, reverberated bouts of spontaneous laughter throughout the remainder of the attraction. We also felt that the lass in the dining area (who playfully mocked us relentlessly for over-thinking her puzzle), the last two characters (the first a hulking stone-faced giant; the second a light-hearted scoundrel) and the gentleman in the trophy room were particularly memorable in their own unique manners. One actress did appear to be having a very difficult time with her lines. She was pleasant enough, mind you… but, during our entire conversation, she seemed fixated on some out-of-sight premonition to the left of our party. It became so distracting that several of us began visually searching the environment for a prompter or cue cards. She was presumably focused on recalling her lines, but it really came off as extremely unnatural and bizarre. 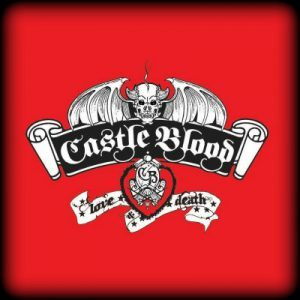 A great cast needs a great wardrobe, and Castle Blood didn’t disappoint. Thematically drifting between varying degrees of classically-gothic, steampunk, and all motifs between, all of the actors appeared appropriately adorned to be wandering the halls of the castle. It’s very rare to see such a variety of really wonderful apparel at an attraction – every character was “all done up” in elegant finery (or an equivalent that suited their moniker). It lended a definite air of authenticity beyond what we are used to experiencing. Make up was often subtle, but effective and efficient. Being primarily human or undead, the residents didn’t require a great deal of visage alteration. The Castle’s facade was well-lit and easy to find and a nearby parking lot provided refuge for our trusty steed – amidst a few unfortunate, man-sized tree limbs that were scattered around the lot. Several restrooms are available on site, as well as a merchandise/food booth, and there was a security guard on duty. A ukulele-equipped, roving band entertained guests preparing to enter the castle. His tales bemused and delighted us. Castle Blood feels like a gothic monolith removed from a Hammer Films-infused, altered reality and relocated to a random city block of Anytown, USA. In a perfect world, the castle would occupy a darkened hillside, enshrouded in perpetual mist. There’d be a foreboding forest, timely lightning cracks – the whole works. With our imperfect reality, however, the castle stands at odds against its surroundings – a defiant embodiment of the eternal Halloween spirit holding back the surge of urban sprawl. All city-based haunted attractions face similar battles, but the clash felt even more prolific at Castle Blood. Still, upon entering the sanguine oasis, this struggle faded from memory rapidly. The castle’s ambiance retunes your perceptions abruptly. Special effects within the castle were limited mostly to a handful of animatronics. Lighting was adequate an accentuated the natural, spooky ambience of the rooms and hallways of the manor. There weren’t a great deal of sound effects in use, but any that existed blended in with the environment. Set design, though, is a different story. Each room that we passed through was meticulously decorated, giving the entire castle a legitimately “lived-in” feeling that enhanced the experience immensely. Every relevant odd-and-end was on display. Instead of over-the-top, blood-splattered vestibules with rotten animal carcasses stacked impossibly high, Castle Blood is arranged in a fashion that a collection of undead dwellers may actually choose to live – function over unbelievable spectacle. The result lends itself perfectly to enhancing the unfolding narrative, not overshadowing it. The haunted attraction community has adopted the label “haunted house” or “haunt” to generically represent any halloween-themed entertainment complex; you know, that’s how a hospital replete with zombified, cannibalistic fungi can nominally become a “haunted house.” Castle Blood, though, represents the term much more intrinsically. Castle Blood is an adventure game/haunted walkthrough/interactive theater that is both entertaining and challenging. Unlike standard “haunted attractions,” the customer is a direct participant in the unfolding storyline and helps to shape its direction… with success at the various obstacles proving critical to guiding the narrative to its most positive conclusion. The situation we found ourselves caught up in involved the vengeful spirits of a pair of witches, a protective talisman and the construction of a mighty obelisk. All in night’s work, surely. Though Castle Blood’s primary function is interactive storytelling, the experience is certainly not without it’s creepy moments. Like the omnipresent dread of a classic horror film, several of our interactions with the residents rose into uneasy crescendos – an invocation by a medium, and a forced possession granted a trickle of nervous fear, for instance. Additionally, the Scarers, scattered across the castle in hidden spaces, were good for more than a few abrupt jolts. There wasn’t a great deal of variety in their tactics, but their appearances were plentiful and always unexpected. Castle Blood is not the best attraction for anyone solely interested in being scared, obviously, but they do provide just enough of a fearful presence to keep you on your toes and frequently glancing apprehensively over your shoulder. A general admission ticket to Castle Blood is $20. A VIP Guest Admission is $25 (available online only), and a Nightmare Pass is $30. The latter includes a general admission plus a t-shirt and a premium gift. There’s also a matinee, no-scares tour for 8 dollars. It took us nearly 1 hour to complete our tour – placing the SCA-LUE at 3 minutes per dollar spent, an excellent deal. It’s no secret that we love interactive haunt experiences. The one-sided booing and scaring are fun and all, but there’s nothing quite as fulfilling as actually being a part of the experience; attractions that require you to complete puzzles or challenges as an integral aspect of their storylines reign supreme in my book. It’s true that Castle Blood is NOT a lot of things that haunt-goers have become accustomed to seeing and, for a certain percentage of scare-fans (those interested only in extreme, in-your-face-style attractions), Castle Blood is really not going to satisfy that masochistic itch. 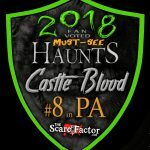 HOWEVER, for the vast majority of the haunt world, Castle Blood has a lot to offer – a truly-interactive, gothic quest with a smattering of frights and a whole cauldron-load of fun. From us, Castle Blood comes recommended!